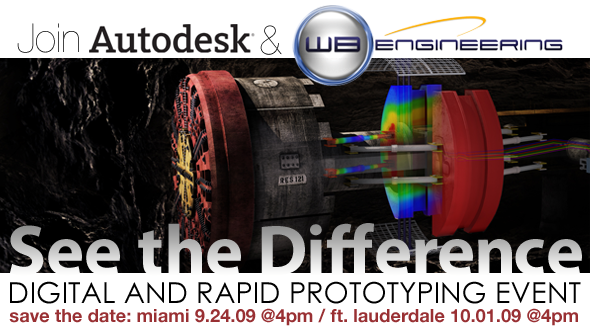 WB Engineering, a 3D Printing and Digital Prototyping company is going to be having a prototyping event two locations South Florida. At this free, interactive event, you�ll see the difference and understand why rapid and digital prototyping is the best ever for expediting product designs to market. Learn tips and tricks and see how this year�s technology and design software compares to previous tools. There will presentations of the latest Autodesk programs like AutoCAD Inventor, Autodesk Alias, 3Ds Max Design and more. Registration is free, so check out WB 3D on the web to find out more. That would be a very nice event for getting a better idea for prototyping. Maybe there would be a next event in some places too. That would be a very nice event for getting a better idea for rapid prototype.